If a determined group of indigenous people get their way, the world’s newest country won’t be in Africa or the Balkans but on the eastern periphery of Australia’s outback. A bleak, foreboding, flood-prone savannah the size of Austria 750 km northwest of Sydney, the Murrawarri Republic was home to an Aboriginal nation that lived in the Culgoa River region of the state of New South Wales (NSW) tens of thousands of years before the arrival of British settlers. On March 31, they took the first step in ending more than 200 years of colonial rule when they sent letters to Queen Elizabeth II and the Australian government demanding evidence of either a treaty or deed of cessation. When those parties failed to respond to the Murrawarri’s 28-day deadline, they issued a Declaration of the Continuance of the State of Murrawarri Nation. "When Captain Cook arrived here in 1770, he said he was claiming the continent in the name of the Crown. But on what legal grounds did he take our land?" asks Sharnee Gibbons, daughter of Fred Hooper, chairman of the Murrawarri People’s Council. Australia’s Aboriginal-sovereignty movement can be traced back to 1972. That year, on Jan. 26 - celebrated nationally as Australia Day - a group of black militants planted a tent on the lawns of the Old Parliament House in Canberra. The Aboriginal Tent Embassy galvanized support for indigenous land rights and thrust its ambassador Michael Anderson into the international spotlight. A former cotton worker, Anderson went on to study law and work as a public prosecutor, becoming the first indigenous Australian to address the U.N. in 1981. In 1999, he traveled to London as tribal leader of the Euahlayi nation and threw a spear wrapped in the Australian flag over the gates of Buckingham Palace in a symbolic rejection of colonial oppression. Today he is convener of the First Nations Interim National Unity Government - an umbrella group representing the sovereign aspirations of members of Australia’s 300-odd Aboriginal nations. "There is nothing in Australian law that shows how the British gained the political and sovereign patronage of the Aboriginal people," he says. "They never asked for our sovereignty, and we never ceded it. So we came up with a hypothesis that the British never really had title of this land." In 1982, that hypothesis was tested in a marathon case spearheaded by Eddie Koiki Mabo, an indigenous man from the Torres Strait who argued for a possessory title of his birthplace, Murray Island, by reason of long possession. When the High Court of Australia finally ruled in Mabo’s favor in 1992 - four months after the plaintiff succumbed to cancer - it established the common-law principle of Aboriginal title. In 1993, the Native Title Act was passed by parliament to develop a system whereby Aboriginals could efficiently facsimile Mabo's posthumous victory. In the decade that has passed, nearly 200 native title claims covering 1.3 million sq km of land - some 18% of the Australian continent - have been approved. But the system has received mixed reviews, with claimants bemoaning its voluminous red tape and perpetual delays. Says Anderson: "You know what blackfellas right across this country use Mabo as an acronym for? Money Available Barristers Only - because they’re the only ones benefitting from the system." Meanwhile a spokesperson for the Attorney-General's Department told TIME it hadn't replied to the Murrawarri People's Council assertion of sovereignty because "there are no constitutional means available for the establishment of separate political communities in Australia," adding that the Australian Commonwealth’s sovereignty over the continent is recognized in international law. The legality of the attorney-general's stance was backed up by George Newhouse, a Sydney-based human-rights lawyer known for his work with indigenous Australians: "Although I recognize this country has largely failed to acknowledge the role that English colonizers played in Aboriginal dispossession, I am not sure the Declaration of the Continuance of the State of Murrawarri Nation has any meaning in law." He adds: "This is not the first time an indigenous group has sought to assert their sovereignty in Australia," referring to Coe v. Commonwealth, an ill-fated 1979 case lodged by then barrister Paul Coe, who sued for land rights for the Wiradjuri nation, a landmass that stretches south from the central NSW town of Nyngan all the way to the Blue Mountains surrounding Sydney. According to Eleanor Gilbert, a nonindigenous filmmaker producing a documentary on Aboriginal sovereignty, Newhouse and his ilk are missing the point because the Aboriginal people have never recognized the Australian constitution. "All those lawyers have to say that because they are bound by the Crown," she says. "Instinctively they know this country was constructed illegally, but they won’t take off their blinkers because they know doing so will open Pandora’s box." Things may soon come to a head. This year, the Murrawarri People’s Council plans to lodge an application for the recognition of the Murrawarri Republic’s status as an independent nation with the U.N. - a move it says will open the floodgates for the 27 Aboriginal nations that have requested template documents based on the Murrawarri’s draft constitution. "Since the idea of sovereignty has come about, there has been a real excitement among our people," says Feli McHughes, a leader of the Ngemba nation. However, the task of winning statehood in the International Court of Justice will make Mabo’s challenge look like a walk in the park. And even that herculean undertaking will pale in comparison with the challenges that lie ahead should the Murrawarri People’s Council get its way: building a landlocked country from scratch for a welfare-dependent people suffering from some of the worst health problems and highest imprisonment rates in the developed world. Then there’s the inconvenient fact that the majority of the 3,000 to 4,000 people living in the area claimed by the Murrawarri Republic are nonindigenous who aren't exactly willing to become its citizens. The half-dozen white Australians I sought feedback from reacted with varying measures of curiosity that morphed into disbelief after hearing the People’s Council is demanding the removal of police, teachers and other public servants from the area. "We are neglected enough by the government. 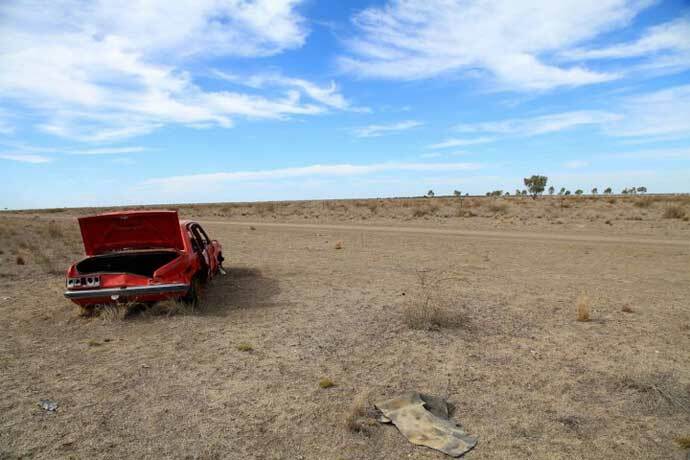 We only got a bitumen road out here a few years ago," says Judy Neale, the nonindigenous manager of the post office and general store at Weilmoringle, a remote community on a suffocatingly dry scrub plain pockmarked with broken cars in what looks a scene from a Mad Max movie. "Who’ll run the school? What about the visiting medical specialist? What will happen to the value of our land? How could we suddenly not be part of Australia?" Anderson answers these and every other question relating to the task of nation building with the indefatigable moral certitude of a man who’s spent his whole life fighting the system. He says all nonindigenous citizens will be encouraged to stay put with favorable tax concessions and new employment opportunities. The council is also looking at a large number of potential income streams to pay for it all, including a repatriation fund, foreign aid from the U.S., the establishment of a tax haven, exporting kangaroo meat and suing the British for looting their country. Even so, from an impartial perspective the Murrawarri’s claim amounts, at present, to little more than a gallant gesture of defiance. Yet it could lead to some form of indigenous autonomy that would finally lay to rest the grievances of Australia’s first nations. "Our people are mature and intelligent," Anderson says. "We’re not picking up guns or throwing Molotov cocktails. We’ve studied our conqueror's laws, proven how they’ve broken them and are now turning those laws against them. We will force an issue the Australian government does not want to debate."